At the recent Supernormal festival held at Braziers Park, Oxfordshire, a number of artists were using analogue technologies to explore concepts that dovetail nicely with the work we do at Great Bear collecting, servicing and repairing obsolete tape machines. Hacker Farm, for example, keep ‘obsolete tech and discarded, post-consumerist debris’ alive using ‘salvaged and the hand-soldered’ DIY electronics. Their performance was a kind-of technological haunting, the sound made when older machines are turned on and re-purposed in different eras. Eerie, decayed, pointless and mournful, the conceptual impetus behind Hacker Farm raises many questions that emerge from the rather simple desire to keep old technologies working. Such actions soon become strange and aesthetically challenging in the contemporary technological context, which actively reproduces obsolescence in the endless search for the new, fostering continuous wastefulness at the centre of industrial production. In Dunning’s contemporary piece he used spools of open reel tape to record a series of automated machines comprised of looping record players, synth drone, live environmental sound and tape loops. This tape is then cut by the artist in metre long segments, placed in see-through plastic bags and ‘sold’ on his temporary market stall used to record and present the work. Dunning’s work exists in interesting tension with the ideas of Pinot-Gallizio, largely because of the different technological and aesthetic contexts the artists are responding to. 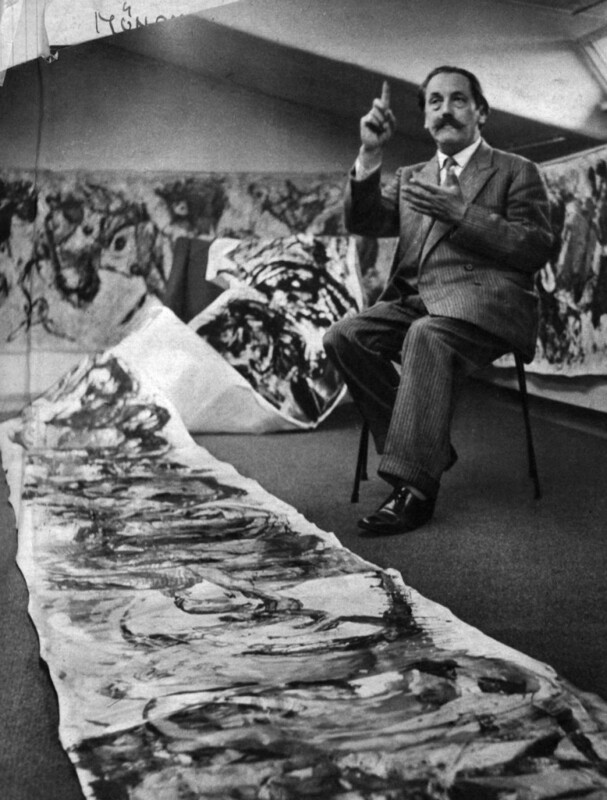 Pinot-Gallizio’s industrial painting aimed to challenge the role of art within a consumer society by accelerating its commodity status (mass-produced, uniform, quantified, art as redundant, art as part of the wall paper). Within Dunning’s piece, such a process of acceleration is not so readily available, particularly given the deep obsolescence of consumer-grade open reel tape in 2014, and, furthermore, its looming archival obsolescence (often cited at ’10-20 years‘ by archivists). In reality, the impression of open reel to reel analogue tape’s rarity is however well justified, as manufacturers and distributors of magnetic tape are increasingly hard to find. Might there be something more complex and contradictory be going on in Dunning’s homage to Pinot-Gallizio? 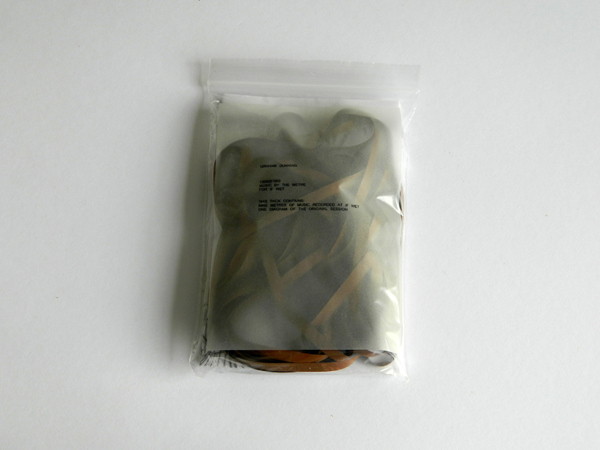 Could we understand it as a neat inversion of the mass-metred-object, doubly cut adrift from its historical (1950s-1970s) and technological operating context (the open reel tape recorder), the bag of tape is decelerated, existing as nothing other than art object. Stuffed messily in a plastic bag and displayed ready to be sold (if only by donation), the tape is both ugly and useless given its original and intended use. It is here Dunning’s and Pinot-Gallizio’s work converge, situated at different historical and temporal poles from which critique of the consumer society can be mounted: accelerated plenitude and decelerated exhaustion. 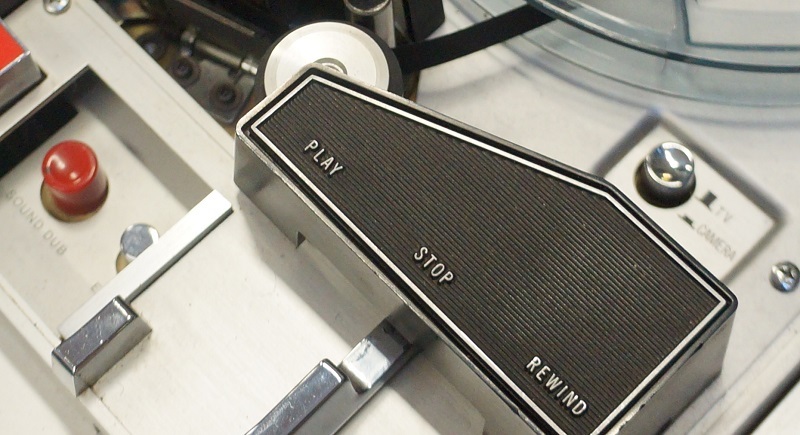 As a company that works with obsolete magnetic tape-based media, Great Bear has a vested interest in ensuring tapes and playback machines remain operational. Although our studio, with its stacks of long-forgotten machines, may look like a curious art installation to some, the tapes we migrate to digital files are not quite art objects…yet. Like Hacker Farm, we help to keep old media alive through careful processes of maintenance and repair. From looking at how contemporary sound artists are engaging with analogue technologies, it is clear that the medium remains very much part of the message, as Marshall McLuhan would say, and that meaning becomes amplified, contorted or transformed depending on historical context, and media norms present within it. 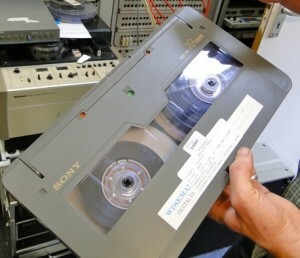 The images in this article are of the first digital video tape formats, the D1, D2 and D3. The tendency to continually downsize audiovisual technology is clearly apparent: the gargantuan shell of the D1 gradually shrinks to the D3, which resembles the size of a domestic VHS tape. Behind every tape (and every tape format) lie interesting stories, and the technological wizardry and international diplomacy that helped shape the roots of our digital audio visual world are worth looking into. In 1976, when the green shoots of digital audio technology were emerging at industry level, the question of whether Video Tape Recorders (VTRs) could be digitised began to be explored in earnest by R & D departments based at SONY, Ampex and Bosch G.m.b.H. There was considerable scepticism among researchers about whether digital video tape technology could be developed at all because of the wide frequency required to transmit a digital image. Several years of product development followed, shaped, in part, by competing regional preferences. As Jim Slater argues in Modern Television Systems (1991): ‘much of the initial work towards digital standardisation was concerned with trying to find ways of coping with the three very different colour subcarrier frequencies used in NTSC, SECAM and PAL systems, and a lot of time and effort was spent on this’ (114). Establishing a standard sampling frequency did of course have real financial consequences, it could not be randomly plucked out the air: the higher the sampling frequency, the greater overall bit rate; the greater overall bit rate, the more need for storage space in digital equipment. In 1982, after several years of negotiations, a 13.5 MHz sampling frequency was agreed. European, North American, ‘Japanese, the Russians, and various other broadcasting organisations supported the proposals, and the various parameters were adopted as a world standard, Recommendation 601 [a.k.a. 4:2:2 DTV] standard of the CCIR [Consultative Committee for International Radio, now International Telecommunication Union]’ (Slater, 116). The 4:4:2 DTV was an international standard that would form the basis of the (almost) exclusively digital media environment we live in today. It was ‘developed in a remarkably short time, considering its pioneering scope, as the worldwide television community recognized the urgent need for a solid basis for the development of an all-digital television production system’, write Stanley Baron and David Wood. Once agreed upon, product development could proceed. 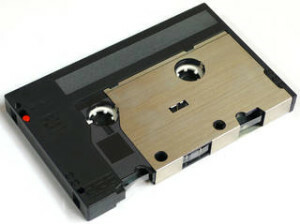 The first digital video tape, the D1, was introduced on the market in 1986. It was an uncompressed component video which used enormous bandwidth for its time: 173 Mbit/sec (bit rate), with maximum recording time of 94 minutes. 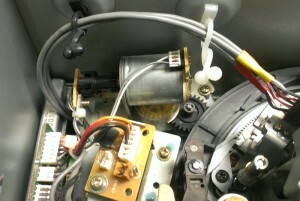 ‘unfortunately these machines are very complex, difficult to manufacture, and therefore very expensive […] they also suffer from the disadvantage that being component machines, requiring luminance and colour-difference signals at input and output, they are difficult to install in a standard studio which has been built to deal with composite PAL signals. Indeed, to make full use of the D1 format the whole studio distribution system must be replaced, at considerable expense’ (125). Being forced to effectively re-wire whole studios, and the considerable risk involved in doing this because of continual technological change, strikes a chord with the challenges UK broadcast companies face as they finally become ‘tapeless’ in October 2014 as part of the Digital Production Partnership’s AS-11 policy. It was fairly inevitable a sequel would be developed because even as the D-1 provided uncompromising image quality, it was most certainly an unwieldy format, apparent from its gigantic size and component wiring. In response a composite digital video – the D2 – was developed by Ampex and introduced in 1988. In this 1988 promotional video, you can see the D-2 in action. Amazingly for our eyes and ears today the D2 is presented as the ideal archival format. Amazing for its physical size (hardly inconspicuous on the storage shelf!) but also because it used composite video signal technology. Composite signals combine on one wire all the component parts which make up a video signal: chrominance (colour, or Red Green, Blue – RGB) and luminance (the brightness or black and white information, including grayscale). 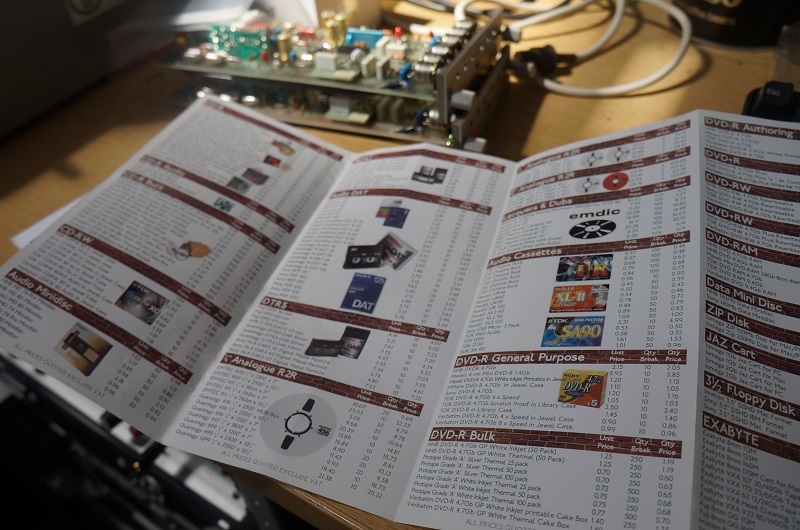 While the composite video signal used lower bandwidth and was more compatible with existing analogue systems used in the broadcast industry of the time, its value as an archival format is questionable. A comparable process for the storage we use today would be to add compression to a file in order to save file space and create access copies. While this is useful in the short term it does risk compromising file authenticity and quality in the long term. The Ampex video is fun to watch however, and you get a real sense of how big the tapes were and the practical impact this would have had on the amount of time it took to produce TV programmes. The D3 was introduced by Panasonic in 1991 in order to compete with Ampex’s D2. It has the same sampling rate as the D2 with the main difference being the smaller shell size. The D3’s biggest claim to fame was that it was the archival digital video tape of choice for the BBC, who migrated their analogue video tape collections to the format in the early 1990s. One can only speculate that the decision to take the archival plunge with the D3 was a calculated risk: it appeared to be a stable-ish technology (it wasn’t a first generation technology and the difference between D2 and D3 is negligible). It has then taken six years to migrate less than a third of the BBC’s D3 archive. Given that D3 machines are now obsolete, it is more than questionable whether there are enough D3 head hours left in existence to read all the information back clearly and to an archive standard. The archival headache is compounded by the fact that ‘with a large proportion of the content held on LTO3 data tape [first introduced 2004, now on LTO-6], action will soon be required to migrate this to a new storage technology before these tapes become difficult to read.’ With the much publicised collapse of the BBC’s (DMI) digital media initiative in 2013, you’d have to very strong disposition to work in the BBC’s audio visual archive department. The development of digital video tape, and the international standards which accompanied its evolution, is an interesting place to start understanding our current media environment. They are also a great place to begin examining the problems of digital archiving, particularly when file migration has become embedded within organisational data management policy, and data collections are growing exponentially. While the D1 may look like an alien-techno species from a distant land compared with the modest, immaterial file lists neatly stored on hard drives that we are accustomed to, they are related through the 4:2:2 sample rate which revolutionised high-end digital video production and continues to shape our mediated perceptions. Generational change for digital technologies are rapid and disruptive. ‘In the digital context the next generation may only be five to ten years away!’ Tom Gollins from the National Archives reminds us, and this seems like a fairly conservative estimate. It can feel like the rate of change is continually accelerating, with new products appearing all the time. It is claimed, for example, that the phenomena of ‘wearable tech chic’ is now upon us, with the announcement this week that Google’s glass is available to buy for £1,000. The impact of digital technologies have been felt throughout society, and this issue will be explored in a large immersive exhibition of art, design, film, music and videogames held at the Barbian July-Sept 2014. It is boldly and emphatically titled: Digital Revolution. To bring such technological transformations back into focus with our work at Great Bear, consider this 2004 brochure that recently re-surfaced in our Studio. As an example of the rapid rate of technological change, you need look no further. A mere ten years ago, you could choose between several brands of audio mini disc, ADAT, DAT, DTRS, Betacam SP, Digital Betacam, super VHS, VHS-C, 8mm and mini DV. Storage media such as Zip disks, Jaz Cart, Exabytes and hard drives that could store between 36-500Gb of data were also available to purchase. RMGI are currently the only manufacturer of professional open reel audio tape. 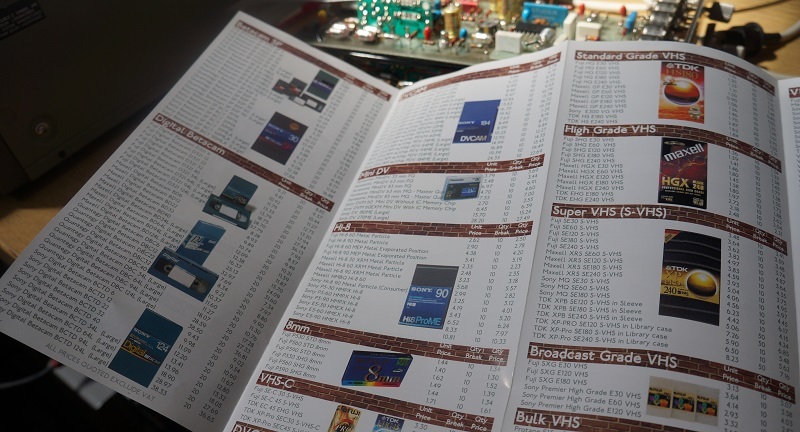 In the 2004 catalogue, different brands of open reel analogue tape are listed at a third of 2014 retail prices, taking into account rates of inflation. While some of the products included in the catalogue, namely CDs, DVDs and open reel tape, have maintained a degree of market resiliency due to practicality, utility or novelty, many have been swept aside in the march of technological progress that is both endemic and epidemic in the 21st century. The history of amateur recording is peppered with examples of people who stretched technologies to their creative limit. Whether this comes in the form of hours spent trying things out and learning through doing, endlessly bouncing tracks in order to turn an 8-track recording into a 24-track epic or making high quality audio masters on video tape, people have found ways to adapt and experiment using the tools available to them. One of the lesser known histories of amateur home recordings is making high quality stereo mixdowns and master recordings from multi-track audio tape onto consumer-level Hi-Fi VCRs. We are currently migrating a stereo master VHS Hi-Fi recording of London-based indie band Hollow Hand. Hollow Hand later adopted the name Slanted and were active in London between 1992-1995. The tapes were sent in by Mark Venn, the bass player with Slanted and engineer for these early recordings that were recorded in 1992 in the basement of a Clapham squat. Along with the Hi-Fi VHS masters, we have also been sent eight reels of AMPEX ¼ tapes of Slanted that are being transferred for archival purposes. Mark intends to remix the eight track recordings digitally but as of yet has no plans for a re-release. 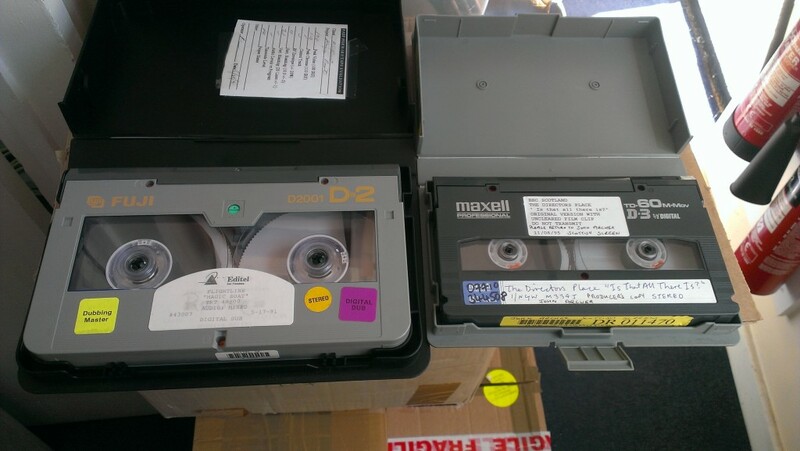 When Mark sent us the tapes to be digitised he thought they had been encoded with a SONY PCM, a mixed digital/ analogue recording method we have covered in a previous blog post. The tapes had, however, been recorded directly from the FOSTEX eight track recorder to the stereo Hi-Fi function on a VHS video tape machine. For Mark at the time this was the best way to get a high quality studio master because other analogue and digital tape options, such as Studer open reel to reel and DAT machines, were financially off-limits to him. It is worth mentioning that Hi-Fi audio technologies were introduced in the VHS model by JVC around 1984, so using this method to record stereo masters would have been fairly rare, even among people who did a lot of home recording. It was certainly a bit of a novelty in the Great Bear Studio – they are the first tapes we have ever received that have been recorded in this way – and take it for granted that we see a lot of tape. Using the Hi-Fi function on VHS tape machines was probably as good as it got in terms of audio fidelity for those working in an exclusively analogue context. It produced a master recording comparable in quality to a CD, particularly if the machine had manual audio recording level control. This is because, as we wrote about in relation to PCM/ Betamax, video tape could accommodate greater bandwidth that audio tape (particularly audio cassette), therefore leading to better quality recordings. Although the recordings of Hollow Hand are in good working condition, analogue masters to VHS Hi-Fi audio do face particular challenges in the migration process. Playing back the tapes in principle is easy if both tape and machine are in optimum condition, but if either are damaged the original recordings can be hard to reproduce. A particular problem for Hi-Fi audio emerges when the tape heads wear and it becomes harder to track the hi-fi audio recording because the radio frequency signal (RF) can’t be read consistently off the tape. Hi-Fi recordings are harder to track because of depth multiplexing, namely the position of the recorded audio relative to the video signal. Even though there is no video signal as such in the playback of Hi-Fi audio, the video signal is still there, layered on top of the audio signal, essentially making it harder to access. Of course when tape heads/ drums wear down they can always be replaced, but acquiring spare parts will become increasingly difficult in years to come, making Hi-Fi audio recordings on VHS particularly threatened. In order to migrate tape-based media to digital files in the most effective way possible, it is important to use appropriate machines for the transfer. The Panasonic AG-7650 we used to transfer the Hollow Hand tapes afforded us great flexibility because it is possible to select which audio tracks are played back at any given time which meant we could isolate the Hi-Fi audio track. The Panasonic AG-7650 also has tracking meters which makes it easy to assess and adjust the tracking of the tape and tape head where necessary. As ever, the world of digitisation continues to generate anomalies, surprises and good stories. Who knows how many other video/ audio hybrid tapes are out there! If you do possess an archive collection of such tapes we advise you to take action to ensure they are migrated because of the unique problems they pose as a storage medium. 2014 will no doubt present a year of new challenges for those involved in digital preservation. A key issue remains the sustainability of digitisation practices within a world yet to establish firm standards and guidelines. Creating lasting procedures capable of working across varied and international institutions would bring some much needed stability to a profession often characterized by permanent change and innovation. In 1969 The EIAJ-1 video tape was developed by the Electronic Industries Association of Japan. It was the first standardized format for industrial/non-broadcast video tape recording. 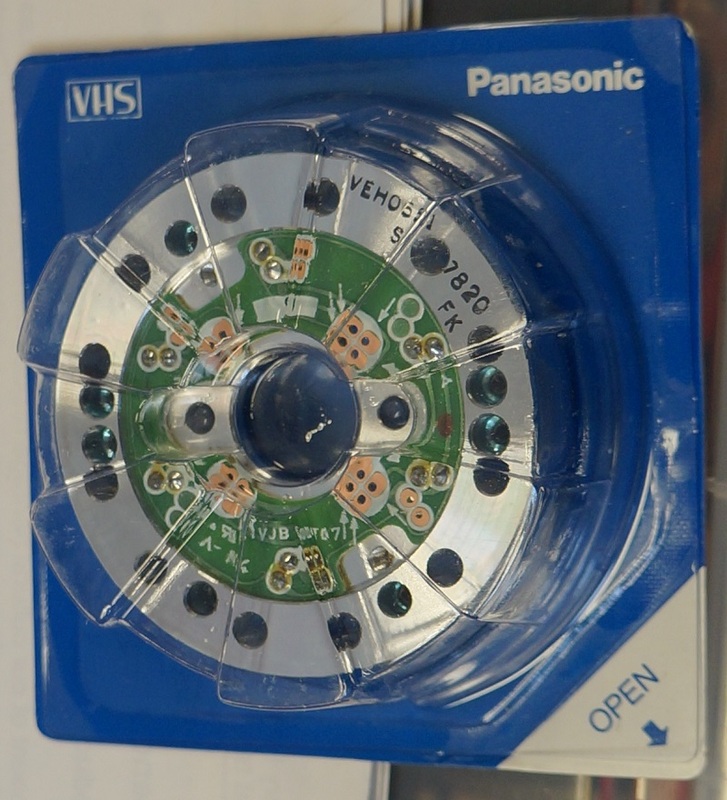 Once implemented it enabled video tapes to be played on machines made by different manufacturers and it helped to make video use cheaper and more widespread, particularly within a domestic context. The introduction of standards in the digitisation world would of course have very little impact on the widespread use of digital technologies which are, in the west, largely ubiquitous. It would however make the business of digital preservation economically more efficient, simply because organisations would not be constantly adapting to change. For example, think of the costs involved in keeping up with rapid waves of technological transformation: updating equipment, migrating data and ensuring file integrity and operability are maintained are a few costly and time consuming examples of what this would entail. Although increasingly sophisticated digital forensic technology can help to manage some of these processes, highly trained (real life!) people will still be needed to oversee any large-scale preservation project. Within such a context resource allocation will always have to account for these processes of adaptation. It has to be asked then: could this money, time and energy be practically harnessed in other, more efficient ways? The costs of non-standardisation becomes ever more pressing when we consider the amount of the digital data preserved by large institutions such as the British Library, whose digital collection is estimated to amass up to 5 petabytes (5000 terabytes) by 2020. This is not a simple case of updating your iphone to the next model, but an extremely complex and risky venture where the stakes are high. Do we really want to jeopardise rich forms cultural heritage in the name of technological progress? One step on the way to more secure standards is the establishment of File Format Action Plans, a practice which is being increasingly recommended by US institutions. The idea behind developing a file format action plan is to create a directory of file types that are in regular use by people in their day to day lives and by institutions. Getting it all down on paper can help us track what may be described as the implicit user-standards of digital culture. This is the basic idea behind Parsimonious Preservation, discussed on the blog last year: that through observing trends in file use we may come to the conclusion that the best preservation policy is to leave data well alone since in practice files don’t seem to change that much, rather than risk the integrity of information via constant intervention. What are the other main challenges facing ‘digital stewards’ in 2014? In a world of exponential information growth, making decisions about what we keep and what we don’t becomes ever more pressing. When whole collections cannot be preserved digital curators are increasingly called upon to select material deemed representative and relevant. How is it possible to know now what material needs to be preserve for posterity? What values inform our decision making? To take an example from our work at Great Bear: we often receive tapes from artists who have achieved little or no commercial success in their life times, but whose work is often of great quality and can tell us volumes about a particular community or musical style. How does such work stand up against commercially successful recordings? Which one is more valuable? The music that millions of people bought and enjoyed or the music that no one has ever heard? Ultimately these questions will come to occupy a central concern for digital stewards of audio data, particularly with the explosion of born-digital music cultures which have enabled communities of informal and often non-commercial music makers to proliferate. How is it possible to know in advance what material will be valuable for people 20, 50 or 100 years from now? These are very difficult, if not impossible questions for large institutions to grapple with, and take responsibility for. Which is why, as members of a digital information management society, it is necessary to empower ourselves with relevant information so we can make considered decisions about our own personal archives. A final point to stress is that among the ‘areas of concern’ for digital preservation cited by the NDSA, moving image and recorded sound figure highly, alongside other born-digital content such as electronic records, web and social media. Magnetic tape collections remain high risk and it is highly recommended that you migrate this content to a digital format as soon as possible. While digitisation certainly creates many problems as detailed above, magnetic tape is also threatened by physical deterioration and its own obsolescence challenges, in particular finding working machines to play back tape on. The simple truth is, if you want to access material in your tape collections it needs now to be stored in a resilient digital format. We can help, and offer other advice relating to digital information management, so don’t hesitate to get in touch. You are currently browsing the greatbear analogue and digital media blog archives for January, 2014.